Showcase Each Commercial Listing as a Unique Single Property Site. SPS helps you with your Commercial Real Estate Marketing - for just a few dollars per listing per month! For sale, or for-lease listings. Office, retail, industrial, multi-family, land and more - SPS helps you to market all types of Commercial Real Estate. 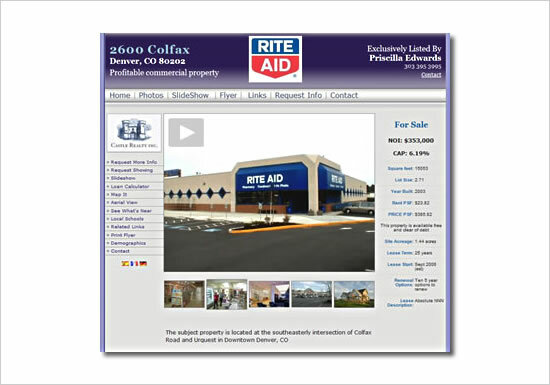 Create a high-impact web site dedicated to your Commercial Property. Our Wizard helps you set up a site in just a few minutes! As well as all the regular features, the following features help you to market your commercial properties. Easily attach relevant documents including floor plans, disclosures, improvements and more! SPS automated marketing will help you reach more prospects and generate more leads. Our CRAIGSLIST auto-posting tool makes getting your listings on craigslist a breeze. With high quality PDF flyers and embedded flash Virtual Tour slide show, each site provides a great resource for potential buyers and tenants. With SPS Widgets you'll be able to present your Commercial Properties in your OWN websites or BLOGS. SPS widgets can be quickly configured to present the listings filtered by your custom criteria, by agent, or category or status. Multiple lead capture mechanisms are automatically included with every site to help ensure your Return on Investment. Retail Properties - Shopping centers and shopping malls, strip center sites, chain store site, showrooms, shops, retail sites, pads, outparcels, major franchise locations free standing stores. Distribution and Industrial Properties - Warehouses for lease and for sale, industrial facilities, industrial parks, factories, factory sites, mills, manufacturing plants. Distribution facilities, cross dock trucking terminals, warehouse space, airports, cold storage and dry storage facilities. High Tech Properties - Research and development parks, office space, scientific building projects, medical laboratories, call centers, NAP, R&D Park. Land Brokerage - Corporate Headquarters locations, land tracts, zoned land parcels, speculative acres , reality sites, business parks, resort properties, residential development tracts, Industrial Parks, waterfront property, regional mall sites. Investment Property - Office buildings, industrial rental properties, realty, multifamily rental, business parks, land parcels, shopping centers, commercial rental properties, regional shopping malls, net leased properties, residential developments.